Digitalization and Blockchain could be a boon to seafarers in all parts of their profession, while their paperwork too could now be secure from fraudulent activities. Seafarers who had faced welfare issues, could also update information about companies, agents and agencies that are problematic and could be a source of warning and red flag for others to be on alert. Information they upload could not be easily changed or tampered with if Blockchain is used, Rev, Nitin Dethe from Mission to Seafarers said at the DataccioConnect event held in Colombo. “Fraudulent agencies would find it difficult to operate, while in the long run, the seafarers would benefit,” he said. The event was organized by DataccioConnect in association with the Sri Lankan Chapter of the Women’s International Shipping and Trading Association (WISTA). “Technology has made tasks and operations much easier in all walks of life and how we adopt new technology, to benefit the seafarers is up to you. As responsible members of the maritime community, companies and those in decision making, need to be more sympathetic to the welfare and needs of the seafarers. We need to direct our efforts to integrate technology to face challenges of seafarers’ welfare, while the use of Blockchain technology would help the seafarers immensely, in getting authentic information concerning vessels of shipping companies and crewing agencies and checking on complaints lodged by previous employees before joining a vessel or signing contracts. 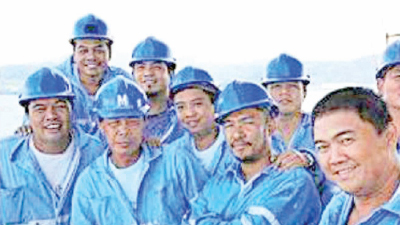 Seafarers need to be vigilant and gather possible information they could find before signing contract with the respective agency,” he said. Connectivity, upgrading of skills of seafarers, piracy, abandonment, wages, criminalisation of seafarers, repatriation, shore level, port welfare are some of the problems faced by seafarers at the moment. He said further that technology could play a vital role in mitigating key issues faced by the seafarers to a great extent.